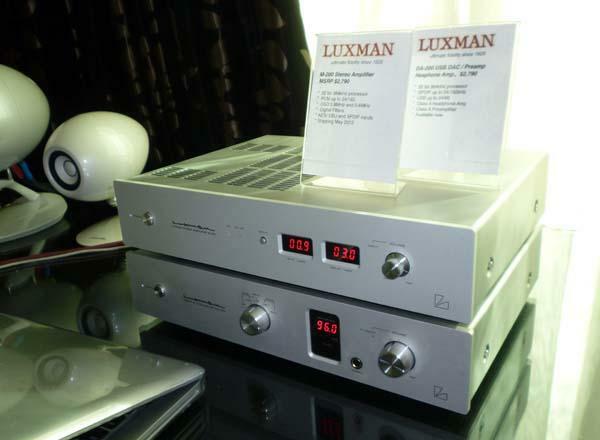 I sought out Manley Labs, manufacturer of tube amplifiers and preamplifiers, at CES. 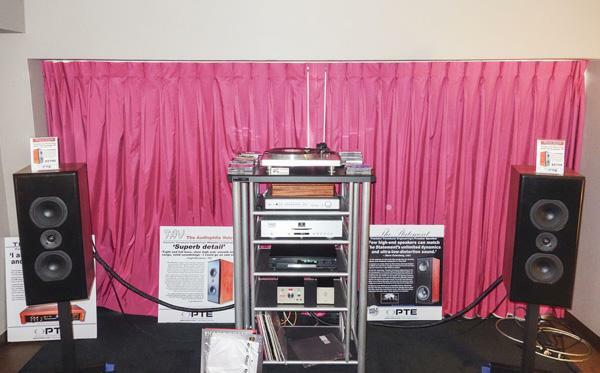 The system in their room included a Music Hall mmf-2.2le turntable, the Chinook phono stage that impressed Michael Fremer last August ($2250), a Steelhead phono preamplifier ($8000), a pair of Snapper monoblock 100Wpc tube amplifiers ($7650/pair), which use four EL34 output tubes, driving Neat Acoustic Ultimatum XLS speakers. EveAnna Manley mentioned after the show that she was working on a secret, prototype1 DAC that promises "to beat all comers." 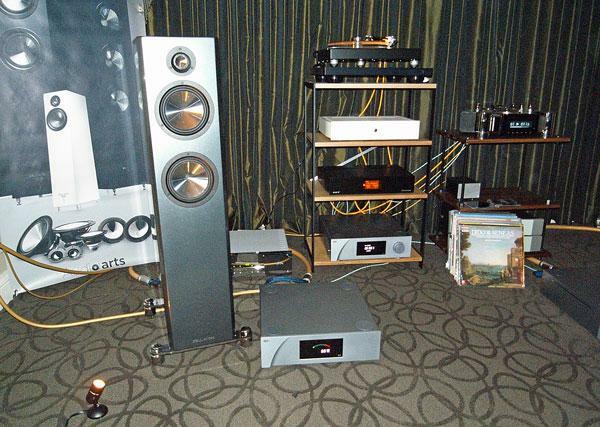 I greatly enjoyed the audio I heard in the Manley Labs room at CES. 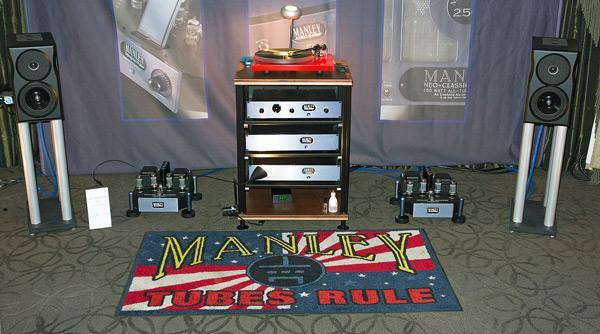 I had to agree with the saying on the rug that appears at every Manley abs exhibit: "Tubes Rule!" Over the last several years, whenever I’ve run into High Water Sound’s Jeffrey Catalano at a show, he reminds me that I have an invitation to visit his NYC salon for a proper listen. I smile, thank him, and honestly agree: Yes, we definitely have to get together soon. It’s gotten to the point now that we don’t even have to talk about it. I know what he’s going to say, he knows what I’m going to say. For no good reason at all, I still haven’t made it down to 274 Water Street. In our November 2012 issue, Michael Fremer reviewed the Spiral Groove SG1.1 turntable ($25,000) with its complementary Centroid tonearm ($6000), an interesting unipivot design that places the pivot point and stylus in the same plane to increase the system’s overall stability. 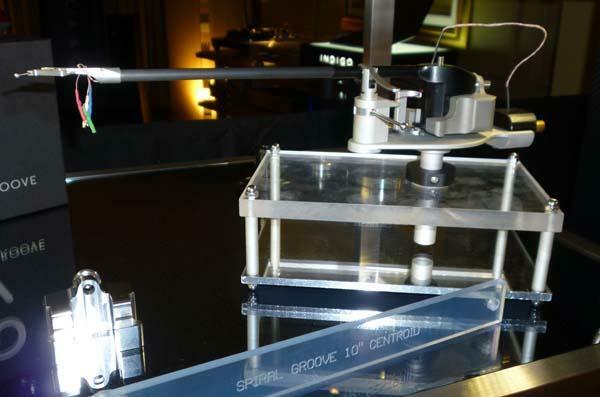 At CES, Spiral Groove showed the new universal version of the Centroid tonearm, a 10” arm with a standard mount. With the supplied setup jig and the Centroid’s easily accessible pivot point, users should be able to determine the correct spindle-to-pivot distance and “accurately set the geometry for overhang and offset angle,” said Immedia’s Stirling Trayle. The universal version of the Centroid tonearm is available now; price remains $6000. 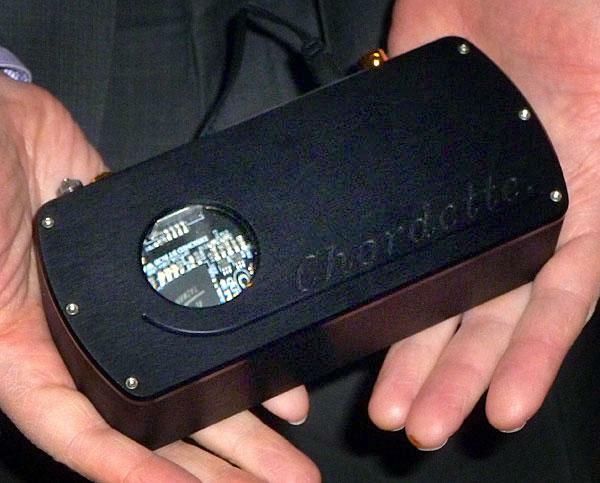 Small and definitely cute, the new Chord DAC has SPDIF and USB inputs and unbalanced analog outputs. 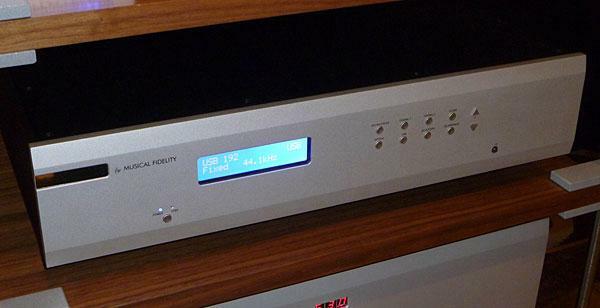 Priced at $1,795 and available now, the QuteHD also handles DSD files and can process streams up to 384kHz. Michael Lavorgna gets into the details in his recent review, but worth noting is that it features a field-programmable gate array (FPGA) to handle the digital to analog conversion process and to automate input selection. Also in Chord's booth, the new DSX1000 retails for $13,000, is available now, and can handle a variety of network sources including ethernet, SPDIF and USB. The DSX1000 also uses an FPGA to handle all of the digital decoding and clocking. Line level and volume controlled outputs are included along with a headphone jack and color display on the front for navigating sources. An iPad app will be available in a couple months. 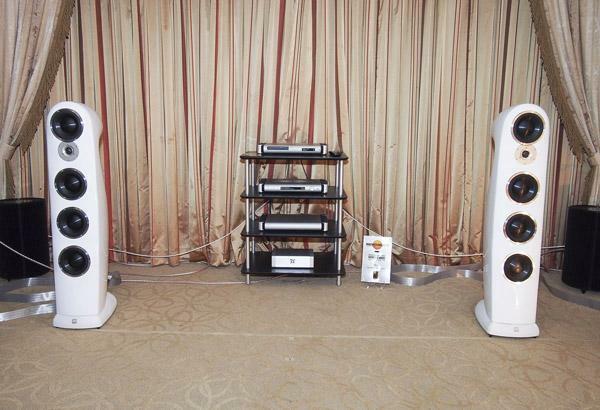 Musical Fidelity had a large multi-room suite atop the Mirage, with multiple systems set up and optimized. One system was set up around the new M1SDAC which retails for $1,499 and should be here by April. Inputs include all the usual digital suspects including USB that can handle 24/192. Since the M1SDAC also functions as a preamp, it has analog inputs which are sampled at 24/96. Outputs included unbalanced analog and digital. But what caught my ear was the Bluetooth capability that allows you to wirelessly connect your Bluetooth device if it has audio files on it. Once received wirelessly, the Bluetooth stream is upsampled to 24/192 by the M1SDAC. Tempo Marketing's John Quick asked me to pull out my iPhone to see if there was some music I'd like to hear. Sure enough I had an uncompressed CD rip of Roxy Music's first album and within seconds it was playing over the system, tracks being controlled from my seat. Maybe not CD quality, but it sounded pretty good with a bit of crunch on the top end. In the main system, the M6 DAC was holding court. Also Bluetooth capable, the M6 DAC runs USB, SPDIF and AES/EBU up to 24/192. All inputs are re-clocked and upsampled to 24/192 for processing and filtering. The filter has two user selectable settings and there are both balanced and unbalanced outputs. 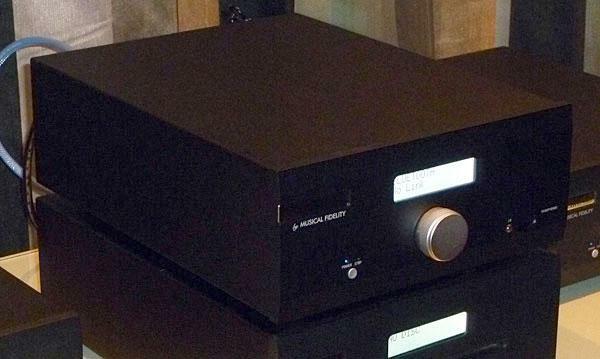 Retail price is $3,000 and the M6 DAC is available now. This time John Quick decided we'd listen to an HD sample and cued up War's "The World is a Ghetto" from HDTracks.com to stunning effect. One of the highlights of CES this year was a chance to hang out with T+A's CEO Siegfried Amft and Manager of R&D Lothar Wiemann, only to discover they were both huge prog rock fans. No wonder I like their stuff. And speaking of progress, T+A pulled out all the stops for their impressive new network and CD player, the MP 3000 HV, companion to the PA 3000 HV integrated amp. 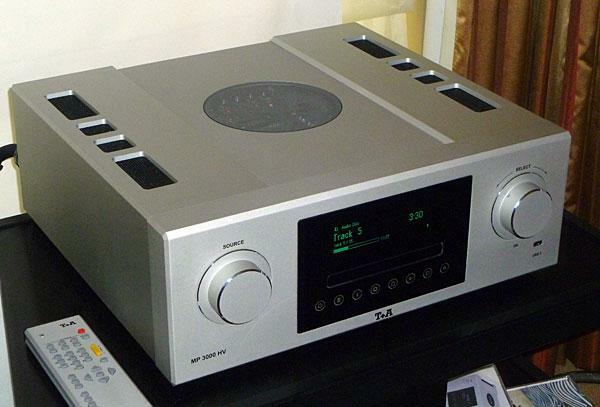 Retailing for $12,500 (though the first two months production run is already sold out) the MP 3000 HV includes the FD 100 bi-directional remote (with color screen), a CD transport, UPnP and DLNA compatible streaming client, internet radio, FM Tuner, and DAC. There are plenty of digital inputs (8), with SPDIF Coax running to 24/192 and USB at 32/192, and several user-selectable upsampling and filter options. Beautifully built as well. 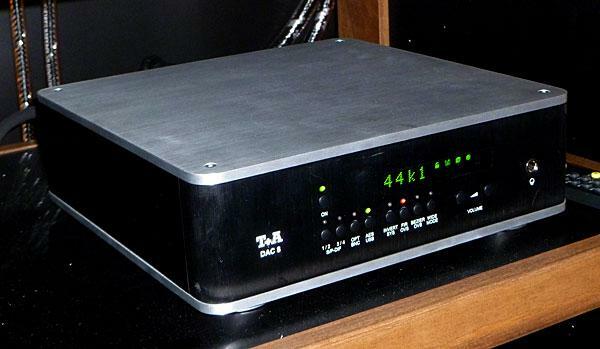 Priced at $3,250 and available now, the compact and sturdy DAC 8 features 4 coax SPDIF inputs, BNC, AES/EBU and USB all capable of handling 24/192 data. Both balanced and unbalanced outputs are available along with a small remote that can control input selection and volume. T+A employs aggressive jitter management, multiple filter options, and runs eight 32 bit Burr Brown converters. All analog stages are fully discrete and I'm going to guess it sounds pretty good too. 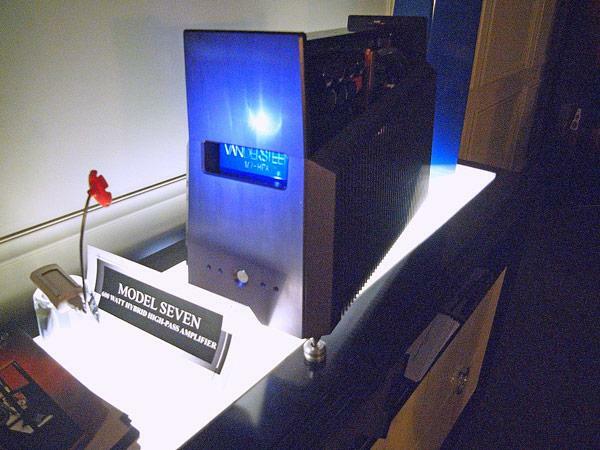 My photograph doesn't do justice to the lustrous blue finish or the immaculate interior construction, but Vandersteen's new M7-HPA power amplifier looks as gorgeous as the Vandersteen Model Seven and 5A loudspeakers with which it is intended to be used. As the HPA in its name implies, the M7-HPA provides a high-pass filtered output (>100Hz) to the upper-frequency drive-units of these two speakers, which have integral powered subwoofers. 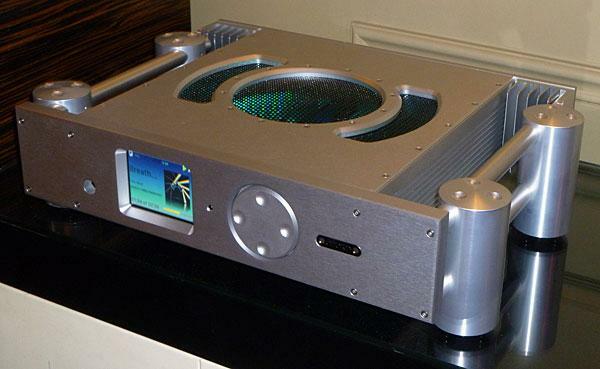 The amplifier uses a tube input stage and a two single-ended solid-state output amplifier stages operating in what Richard Vandersteen calls "push-push," all mounted with a sprung suspension and kept cool with a liquid cooling system. Price is projected to be between $30,000 and $40,000/pair. 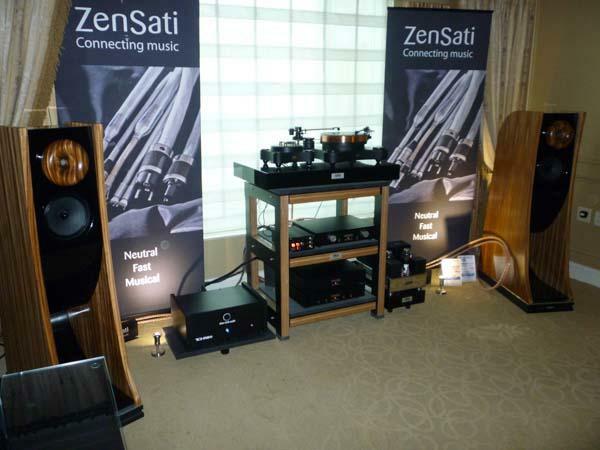 Manhattan retailer/distributor Audio Arts was showing the Zellaton Grand loudspeaker ($39,750/pair). This combines a tweeter and two 7" mid-woofers using aluminum foil-faced rigid-foam diaphragms first developed in 1935 by Emil Podszuswhich I had first seen and heard in the Pawel Ensemble minimonitors from 20 years agowith a downward-firing woofer in a cabinet that is open to the rear. 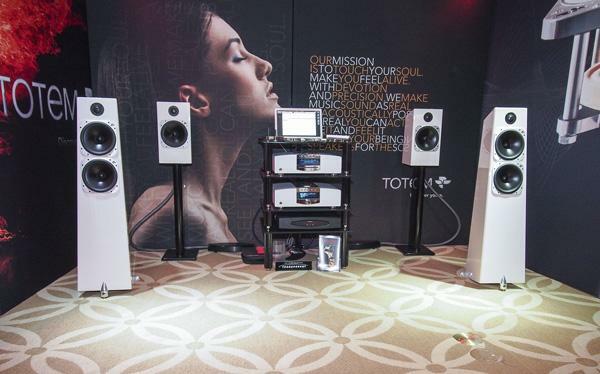 Morel had two setups at CES: one featuring a pair of Soundspot SP 3 satellites and 8” bass unit ($1799/pair) and, in another room, a pair of Sopran floorstanders, the latter winner of the 2013 CES Design and Engineering Innovations award. The Sopran ($12,000/pair} is one-down from the $34,000/pairand, in my opinion, unfortunately-namedFat Lady. The Sopran is a three-way, five-driver speaker, proprietary drivers and a molded carbon-fiber composite cabinet that I find a refreshing change from the usual wooden box. Have you ever attended one of those speaker demos where a large pair of floorstanding speakers were supposedly playing, and then it was revealed that the speakers playing were small hidden ones? (I recall Joseph Audio doing one of these.) Well, it was something like that in the Totem room, but not intentionally. The speakers that I thought were playing were the Metal floorstanders ($12,000/pair) and I was particularly impressed by the deep, dynamic bass produced by these speakers. And then . . . in discussing the performance of the speakers with designer Vince Bruzzese, I found out that the speakers playing were not the Metals but the much smaller bookself-type Fires ($6000/pair) . . .